James Hansen, director of NASA's Goddard Space Institute, has recommended that no further coal plants be built that do not capture their carbon dioxide emissions, and has further recommended that all coal emissions be phased out by 2025 in the developed world and by 2030 in the developing world. According to Hansen, the consequence of emissions continuing beyond that time is increasing risk of passing "tipping points" and "points of no return." 14 Distribution of Coal-Fired Generation in the U.S. Under this coal phase-out schedule, the study assumed that 110 Gigatons of carbon would be released into the atmosphere from coal during the period 2007-2050. Kharecha and Hansen also consider three other scenarios, all with the same coal phase-out schedule but each making different assumptions about the size of oil and gas reserves and the speed at which they are depleted. Under the Business as Usual scenario, atmospheric CO2 peaks at 563 parts per million (ppm) in the year 2100. Under the various coal phase-out scenarios, atmospheric CO2 peaks at 422-446 ppm between 2045 and 2060. The implication of the study is that a phase-out of coal is a much more potent remedy for global warming than any actions that might be taken in limiting or stretching out the use of oil and gas. 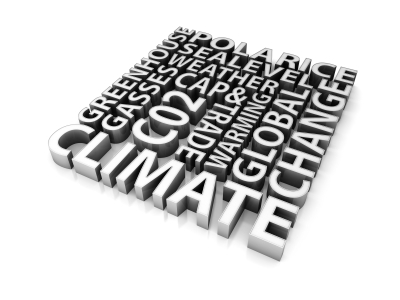 Citing the need for urgent action to avoid catastrophic climate change, former U.S. Vice-President Al Gore made a speech in Washington, D.C., on July 17, 2008, in which he proposed that the United States "commit to producing 100 percent of our electricity from renewable energy and truly clean carbon-free sources within 10 years." According to Gore, such a goal had become more feasible because "[t]he sharp cost reductions now beginning to take place in solar, wind and geothermal power, coupled with the recent dramatic price increases for oil and coal, have radically changed the economics of energy." Gore compared the effort involved to the John F. Kennedy's challenge to reach the moon in a decade, which launched the Apollo program: "Some of our greatest accomplishments as a nation have resulted from commitments to reach a goal that fell well beyond the next election: the Marshall Plan, Social Security, the interstate highway system." Gore argued that a ten-year plan is "the maximum time that we as a nation can hold a steady aim and hit our target," whereas plans with much longer time horizons, "such as a political promise to do something 40 years from now," are "universally ignored because everyone knows it's totally meaningless." Gore noted that upgrading the nation's electrical transmission infrastructure would be a key component of his proposal. In October, 2008, WeCanSolveIt.org released further details on the Gore plan. Titled "Repower America,"the plan provided two scenarios for 2020, one of which included a small contribution from carbon capture and storage technology (CCS) and one which did not. In both scenarios coal was primarily replaced by a combination of increased efficiency, wind, and solar thermal, with smaller contributions from geothermal and photovoltaics. In 2009, the Union of Concerned Scientists (UCS) released a study showing how U.S. coal use could be cut by over 85% by 2030, replacing the power with efficiency, combined heat and power, and renewable energy. The study, Climate 2030: A National Blueprint for a Clean Energy Economy, looked at the economic and technological feasibility of meeting specific targets for reducing global warming emissions, with a cap set at 26% below 2005 levels by 2020 and 56% below 2005 levels by 2030. It was primarily based on a modified version of the National Energy Modeling System (NEMS) model used by the Department of Energy, and compared a business-as-usual reference case to a scenario with a suite of climate and energy policies, including a comprehensive cap and trade program and a national renewable energy standard. Not only did the modeled climate and energy policies reduce coal use from over a billion tons in 2005 to 137 million tons in 2030 (see pages 138-9 of the full report), but economy-wide the policies saved consumers and businesses hundreds of billions of dollars annually by 2030. Coal power with carbon capture and storage (CCS) and advanced nuclear power played a very limited role under the policy scenario. Only 7 gigawatts (GW) of new coal with CCS appeared by 2030, and most of that (4.8 GW) was a model input to reflect a program of subsidized CCS demonstration projects. No advanced nuclear plants were added by the model beyond the 4.4 GW of new capacity added in the reference case. Secondary environmental and health benefits from phasing out coal plants, such as reductions in mercury and sulfur dioxide emissions, and ending mountaintop removal mining. The stock of existing U.S. coal-fired power plants is relatively old: the median aged generating unit was built in December 1964. Out of total coal-fired capacity of 336,000 MW of capacity, only 39,000 MW of capacity (about 12 percent) have been built since 1985. This means that by 2025 phase-out date proposed by James Hansen, 88% of the existing plants will have reached the age of 40 or above. A price isn’t what is needed to stop building any new coal plants and shut down every existing one in 10 years in rich countries and 20 years everywhere else — and replace all that power (plus growth) with carbon-free generation and efficiency. Indeed, I can’t imagine how high a price would be needed but it is probably of the order of $1000 a ton of carbon or more starting in 2010. Talk about shock and awe. Remember, we are talking about a carbon price so high that it actually renders coal plants that have been completely paid for uneconomic to run. And once you stop new demand and start shutting down existing plants, the price of coal will collapse to almost nothing. Once you start building all of the alternatives at this unimaginable pace, bottlenecks in production and material supply will run up their costs. The collapse in coal prices, making existing plants very cheap to run, together with the run up in the price of all alternatives will force carbon prices even higher. But, in any case, if you want to replace all those existing coal plants with carbon free power that fast, again the carbon price is almost beside the point. In an editorial published in the New York Times, Entergy CEO J. Wayne Leonard argued that renewable portfolio standards (RPS) should be abandoned in favor of a cap-and-trade system. According to Leonard, the type of conventional energy displaced as the result of an RPS requirement is more likely to be expensive gas-fired generation rather than comparatively cheap coal-fired generation. A 2010 study by The Brattle Group, "Potential Coal Plant Retirements Under Emerging Environmental Regulations" found that proposed U.S. Environmental Protection Agency (EPA) regulations on air quality and water for coal-fired power plants could result in more than 50,000 MW of coal plant retirements, and require an investment of up to $180 billion for remaining plants to comply with the rules. According to the study carried out by economist Dr. Metin Celebi, 40,000 to 55,000 MW of coal capacity would retire if scrubbers and selective catalytic reduction (SCR) equipment were to be mandated by 2015 for all coal units. 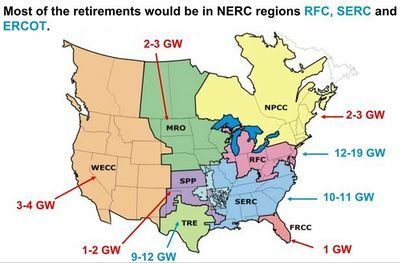 Another 11,000 to 12,000 MW could retire if cooling towers are also mandated, bringing the total retirements to between 50,000 to 67,000 MW, or roughly 20 percent of installed coal plant capacity. The study found that up to 56,000 MW, or three-quarters, of the retirements would be merchant plants, which sell power into competitive wholesale markets, with "significantly fewer closures" among regulated coal-fired plants that can pass off their costs to ratepayers. As a consequence, the effects will be concentrated in the Southeast (SERC), the mid-Atlantic (RFC), and Texas (ERCOT). The Brattle Group said retirements could represent up to 72 percent of all coal plants and could reduce coal demand by about 15 percent by 2020. Assuming that all of the lost coal-fired generation was replaced by natural gas-fired combined-cycle generating plants, CO2 emissions could fall by 150 million tons per year. As the table shows, this scheme results in the retirement of 95% of currently existing coal capacity by the year 2029. A reverse-seniority phase-out would allow a smoother adjustment process, since plant and captive mine workforces could be shrunk in an orderly fashion without layoffs as workers retire and manpower is shifted to the younger generating units at a given location. Communities could adjust in stages. Where possible, baseload generators and transmission infrastructure could be re-purposed. One issue that may be important with respect to some coal plants is the date of their most recent "rebuild." A simple reverse seniority phaseout may fail to take into account that plants have been substantially rebuilt, and there is "new debt" on them which has not been paid down. Where investments were made prior to 2008 in a plant, it may be appropriate to assign a new "age" to the plant to reflect the investment and rebuild. For example, the Centralia plant in Washington State was originally built in 1972. Under the "simple" reverse seniority process, this unit would be subject to retirement in 2020 - 2024. But the investment in SO2 scrubbers and Low-Nox burners was made in 2002-03, and that cost nearly equalled the original construction cost (in nominal dollars). A feature of both California and Washington law is that coal plant owners are not allowed to make substantial NEW financial commitments to power plants emitting more than 1100 #/MWh of CO2, so this type of investment would not be permitted today. Allowing at least 20 years for recovery of rebuild costs is probably fair. Utility debt is often issued for a 30-year term, and this could be the outlier date. In the case of Centralia, therefore, the latest date would be 2033 -- the rebuild date plus 30 years. In California, regulators have determined that 10 to 15 percent of cars produce 50 percent of emissions. In order to accelerate the scrapping of such vehicles, the Bay Area Air Quality Management District offers a $650 bounty for recycling cars manufactured prior to 1988. The Vehicle Buyback Program is funded through the Air District's Transportation Fund for Clean Air (TFCA). The gross polluter model matches the coal plant phase-out issue in that coal plants represent a small number of emitting sources in private hands that produce a large proportion of emissions. Distribution of Coal-Fired Generation in the U.S. This map shows the distribution of coal-fired generation in the United States in July 2006. Like coal mines and power plants, military bases often serve as major providers of jobs in rural areas. For that reason, the Base Realignment and Closure (BRAC) process of the United States government, created in 1988, provides a model for dealing with the political challenges and the socio-economic impacts that might be encountered in phasing out coal mines and plants. Since Congress created the BRAC process in 1988, more than 350 installations have been closed in four rounds: 1989, 1991, 1993, and 1995. Pentagon officials submit a list of bases to be closed, shrunk, or enlarged. An independent nine-member commission, the BRAC Commission, takes testimony from interested parties and visits affected bases. The commission submits its list to the President, who must approve or disapprove of the list in its entirety. If approved, the list goes to Congress, which has the opportunity to disapprove the list within 45 days; otherwise, the list becomes final. Community Development Block Grants (CDBG): Administered by the Department of Housing and Urban Development, the CDBG provides federal funds for community and economic development projects, including job creation and retention efforts. Economic Development Administration (EDA): Located with the Department of Commerce, the EDA provides grants to leverage private sector and local public sector dollars for targeted investments to alleviate sudden economic dislocation caused by base closures. Workforce Investment Act (WIA) National Emergency BRAC Planning Grants: These funds provide assistance in planning for layoffs resulting from BRAC, with locations facing the largest impact getting priority attention. In 2001, Ontario generated 37,000 Gigawatt hours of electricity from coal. In 2007, Ontario's Labor government committed to phasing out all coal generation in the province by 2014. Premier Dalton McGuinty said, "By 2030 there will be about 1,000 more new coal-fired generating stations built on this planet. There is only one place in the world that is phasing out coal-fired generation and we're doing that right here in Ontario." According to the UK Committee on Climate Change report "Building a Low-Carbon Economy," a large amount of coal capacity will be retired in the United Kingdom over the next fifteen years due to the European Union Large Combustion Plant Directive. This creates an opportunity for adding climate-friendly power sources into the power supply mix. 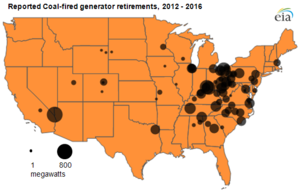 For plant-by-plant retirement details, see Coal plant retirements. ↑ R. Cleetus, S. Clemmer, and D. Friedman, “Climate 2030: A National Blueprint for a Clean Energy Economy,” Union of Concerned Scientists, 2009. ↑ "Existing Capacity by Energy Source", Energy Information Administration website, accessed April 2008. ↑ Appendix S: "Life After BRAC" Resource Finder"
"Beyond Business as Usual: Investigating a Future without Coal and Nuclear Power in the U.S.," Synapse Energy Economics, May 5, 2010. This page was last edited on 19 March 2015, at 18:34.